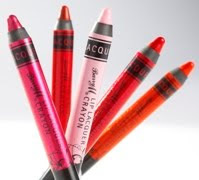 Barry M are soon to be releasing a new product to their ever growing make up brand & this time its the Lip Laquer Crayons. Which literally just look like giant crayons, but for your lips! I definitely like the sound of party & ballet pink! Party pink is quite a dark, bright pink whilst ballet pink is a lighter, baby pink! Sound fabulous! You can get them from Barry M now or they will be available in Superdrug from the 27th January! What are your overall thoughts of this product and will you be buying? They do look like Crayons, that's kinda cool though. makes them different to any other lip pencils that are out there. Looking forward to trying these out when their released! They look like the colour of the blushes don't they.. Can't wait to try! I like the look or the rose, the light pink and the orangeee! I can't wait to try them and see if theyre any good! Ive out the date in my phone haha! Oh wow :D I wish they had more neutral colors! Those Barry M crayons look so cool. I would definitly try them. I love the colors they look so vibrant! Ohh i want to try those - i wonder what the texture will be like..
Love the look of these! Hardly breaking the bank either.